DUBAI, United Arab Emirates (AP) — Qatar on Wednesday signed a 5 billion euro ($5.9 billion) deal to purchase seven naval vessels from Italy, a reminder of the small Gulf state’s purchasing power despite a blockade from neighboring countries. 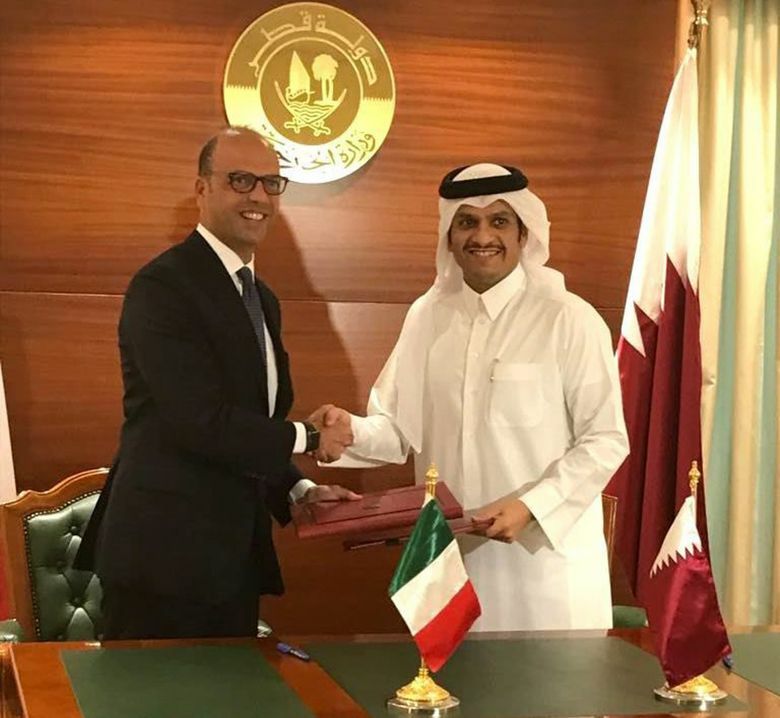 Qatar’s Foreign Minister Sheikh Mohammed bin Abdulrahman Al Thani announced the defense deal at a joint news conference in Doha with Italian Foreign Minister Angelino Alfano. They did not provide more details on the deal, saying only that it underscored the countries’ ongoing defense cooperation. Qatar, which is the world’s largest liquefied natural gas exporter, and other energy rich Gulf Arab states are among the world’s biggest spenders on military equipment. The deals signed over the years with the U.S. and European allies have helped cement bilateral ties, but have also made the diplomatic fallout around Qatar all the more politically sensitive. Qatar also hosts the hub for U.S.-led operations against the Islamic State group in Iraq and Syria. The dispute erupted in early June when the four countries of Saudi Arabia, the United Arab Emirates, Egypt and Bahrain cut diplomatic ties and transport links with Qatar. Saudi Arabia also sealed shut Qatar’s only land border, impacting a significant source of food imports, and barred it from using its airspace, which has forced Qatar’s flagship carrier to take longer routes over Iran. The crisis has prompted a flurry of international visits and meetings to try and resolve the crisis. Earlier this week, the quartet said they would be open to dialogue with Qatar if it accepts their demands to change its policies in the region first. They also insisted that Qatar comply with a sweeping list of 13 demands as well as six broader principles that center around cracking down on terrorism financing. In remarks at the news conference Wednesday, Al Thani insisted that any talks respect Qatar’s sovereignty and said his country has never put forth conditions for dialogue. He also appeared to dismiss the quartet’s latest comments that Qatar comply with their demands. The four Arab states accuse Qatar of supporting extremists and interfering in their affairs by supporting opposition Islamist groups. Qatar denies the charges and sees them as politically motivated. They are demanding that Qatar stop terrorism financing, but also that it shut down its flagship Al Jazeera news network, which the quartet say has been used by Qatar to promote its policies. Other demands include closing a Turkish military base in Qatar, limiting ties with Iran, expelling Islamist political figures and paying restitution for victims of terrorism allegedly linked to Qatar. Qatar rejects the list as an affront to its sovereignty, but has vowed to combat terrorism financing and in recent weeks issued a decree revising the country’s counterterrorism laws.